The most revolutionary scientific discoveries often come from simple observations. The life of all living things, for example, is a series of chemical processes, whose energy is regulated by natural catalysts. 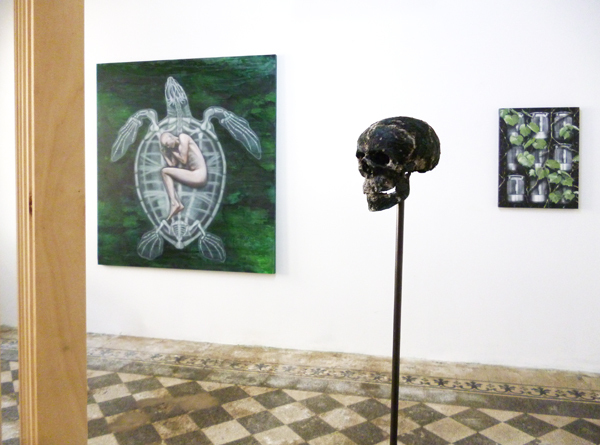 And Katalys is, indeed, the solo show by Günter Pusch, at Ca’ Zanardi in Venice, until 30 June 2015. Kept in a wood cage, a mechanical catalyst, representing the symbolic filter of the relationship between science and mankind, holds a wordless conversation with a human skull. The exhibition is about the theme of the balance between nature and technological progress: a new life force smoulders under the ashes of postmodern sensibility and grafts science on to art, project on to storytelling. Although fantasies about the future of humanity, from the historical avant-gardes onwards, were connected to a reality whose alteration would be recognizable in its material pieces, made of grafts and assembled parts, (“we aspire to the creation of a non-human type […] / [it] will possess the most unusual organs; organs adapted to the needs of an environment in which there are continuous clashes.” F.T. Marinetti), Pusch, instead, seems to affirm that forms of metamorphosis, of “re-creation” of the human being, comes from the mechanical components to biology, from the external object (the prosthesis of mutilated people in Grosz’s works) to a real bio-technology “sensibility”. 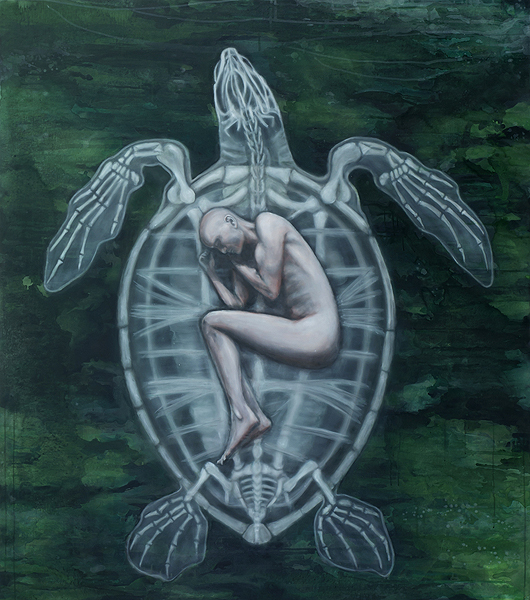 In his work Take me home, Pusch portrays a human body in an ultrasound scan drawing up his knees and rolled into a fetal position within the abdomen of a turtle. The living thing, the most human of the exhibition, is represented during the gestation period, when the relation between the human being and the life/nature is stronger but, at the same time, closer to the fracture. Cyber-gods, Apollo, the god of arts, and a deer (maybe Artemis, the goddess of the hunt) appear instead as mechanical-biological hybrids where is constant the presence of the catalyst, engine of life processes. After a degree in architecture at University of Munich, specialized in urban studies, Günter Pusch worked as apprentice mechanic and travelled a lot in the region of Southeast Asia. By painting urban landscapes, he calls into question the relationship between science and human being, work and industrialisation, trying to adopt a positive attitude and, in the meanwhile, being critical towards the status quo. In the last fifty years, the scientific evolution has increasingly become a primary source of wealth. The engineering dream of control and manipulation of life and natural processes made stronger the relationship between biology and economics. When the subject is not an urban landscape, nor a mechanical element, Pusch paints a mask, an icon lifeless, deep inside the layers of colours, while on the background a ghost town lies abandoned to the fate of a destructive industrialization. 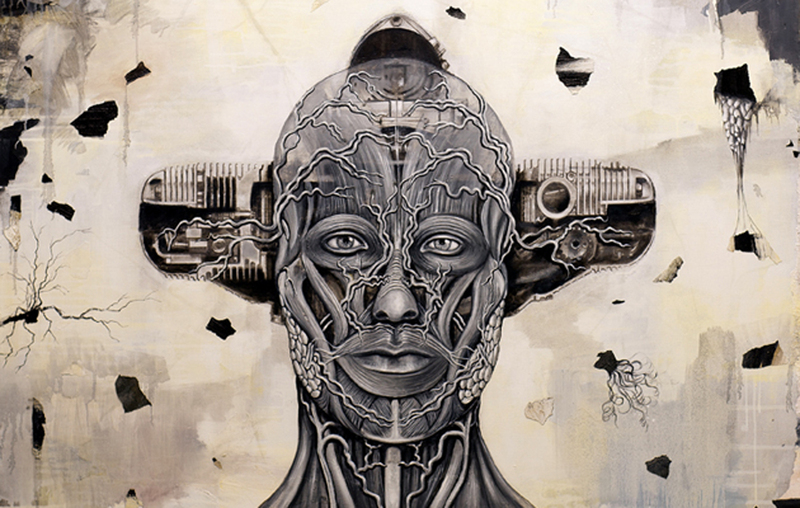 Again the artist combines visual (figurative and abstract) and conceptual (human-artificial) categories. Once again, the changing of nature, the human being transformation inside, the radical change of perceptions and feelings, reveal a sense of unease and worry. The exhibit ends with a poetic passage: a film dedicated to Mr Imagination, aka the African-American artist Gregory Warmack, shot by Pusch during a Venetian night after a chance encounter with the artist. Chemical processes move human relationships and their mystery makes sense of life.